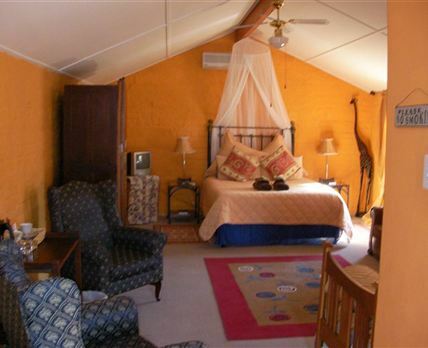 Die Kliphuis Guest House: This unique venue, housed in a national monument built circa 1857, epitomizes hospitality and service where owners Hercules and Gerrit guarantee your visit will be all that you desire. The guest house is centrally located within walking distance of many attractions. Die Kliphuis is the ideal place to relax and enjoy the company of loved ones and friends. Enjoy a cup of coffee or a piece of Kliphuis’ divine cake, a romantic dinner in the well-appointed dining rooms, or alfresco dining in the garden. Accommodation is provided in the converted wagon house situated off-street in a lush garden. The garden can be viewed from the two large stylishly furnished rooms, The Wagonshed and Loft. Both rooms are air-conditioned and feature en-suite Victorian baths, TVs, lounge suites and tea and coffee facilities. Click here to enquire at Die Kliphuis Guest House.